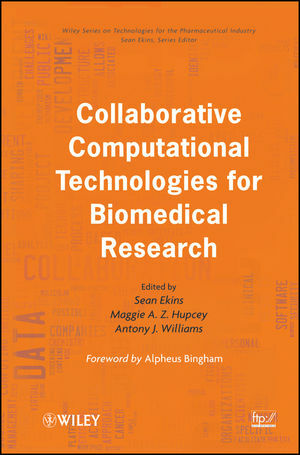 A must-read for anyone working in the pharmaceuticals industry or academia, this book marks a major step towards widespread collaboration facilitated by computational technologies. SEAN EKINS, MSc, PhD, DSc, is the Principal at Collaborations in Chemistry, and Collaborations Director at Collaborative Drug Discovery, Inc., as well as an Adjunct Associate Professor in the Department of Pharmaceutical Sciences, University of Maryland School of Pharmacy. He has published more than 170 papers and book chapters on computational and in vitro drug discovery approaches and has previously edited or co-edited three books for Wiley. MAGGIE A. Z. HUPCEY, PhD, is a chemist working within the Life Sciences and Healthcare Practice of PA Consulting Group in Princeton, New Jersey. She has worked on collaborative projects for the design and development of new products and processes in the medical device, drug delivery, and drug discovery fields, including presubmission and post-launch regulatory compliance activities. ANTONY J. WILLIAMS, PhD, FRSC, is currently Vice President, Strategic Development, at the Royal Society of Chemistry and holds an adjunct position at UNC-Chapel Hill. He has written chapters for many books and published more than 100 peer-reviewed papers and book chapters on NMR, predictive ADME methods, Internet-based tools, crowdsourcing, and database curation. He is an active blogger and participant in the Internet chemistry network.